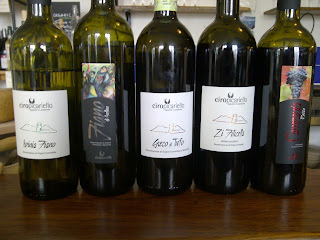 I heard about this small producer a while ago, I tried to visit them during a recent trip to Campania. I got lost so many times that even the GPS gave up at the end. During my two days there, I found myself going back to their stand over and over again with the excuse of tasting them one more time, you know, just to be sure. I was doing it for the smile they were putting on my face. This is what wine is all about. A very simple wine making technique: only indigenous yeasts used, SO2 reduced to the absolute minimum, long fermentation that allows the wine to go completely dry with no residual sugar and long ageing on the fine lees, no filtration or fining. And of course, great grapes from very old vines. Ciro Picariello’s vineyards are located part in Summonte (at 650 meters above sea level) and part in Montefredane (500 meters above sea level) in the Fiano di Avellino DOCG area. The combination of very old vines (80 years old on average), high altitude and rich volcanic soil gives wines with incredible minerality, a pronounced flintiness and a smokey character, very clean and with no heaviness. The almost Alsatian Greco di Tufo has the characteristic spiced, fruity, luminous palate with a fresh minerality similar to the Fianos (and not easy to find in Greco wines). On the red front, the Campania Rosso is an unusual field-blend of Aglianico, Piedirosso and Sciascinoso (grapes are picked and fermented together): fresh, crunchy and vinous is the best wines for charcuterie you could ever imagine. The Aglianico “Zi Filicella” would be a Taurasi if not for the only steel ageing. The tannic-acidic punch of the high altitude Aglianico is tamed and balanced by a rich, intense fruit. A wine great to drink now but with a great ageing potential. All available in Sheridans Wine Bar & Shop in Galway. really adore the whites from campagna-- just got back!